Feeling in a festive mood (and trying to finish off the four pounds of strawberries on my hands), I came up with this pretty pink creation. I think it would be great to add it to a Champagne flute with a splash of some bubbly. 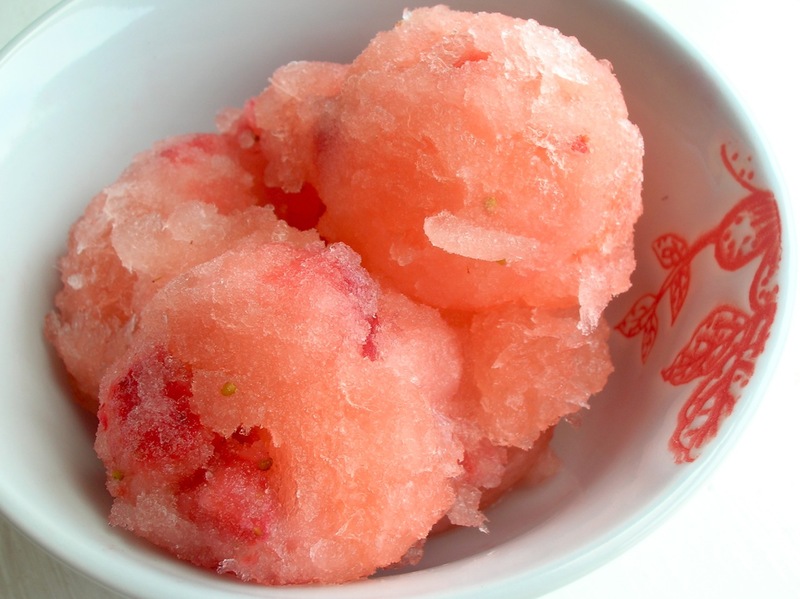 This sorbet is boozy and crisp with sweet strawberry tang. 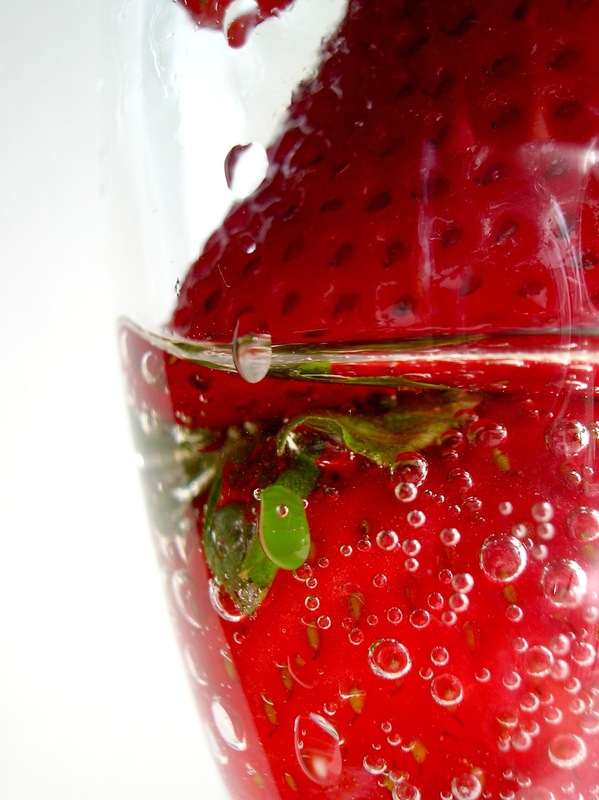 Soak the strawberries in Champagne so that they absorb the flavor. 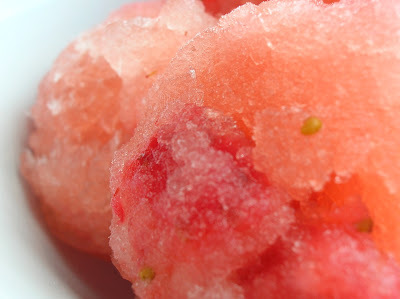 The alcohol will help prevent the strawberries from becoming too hard when frozen. 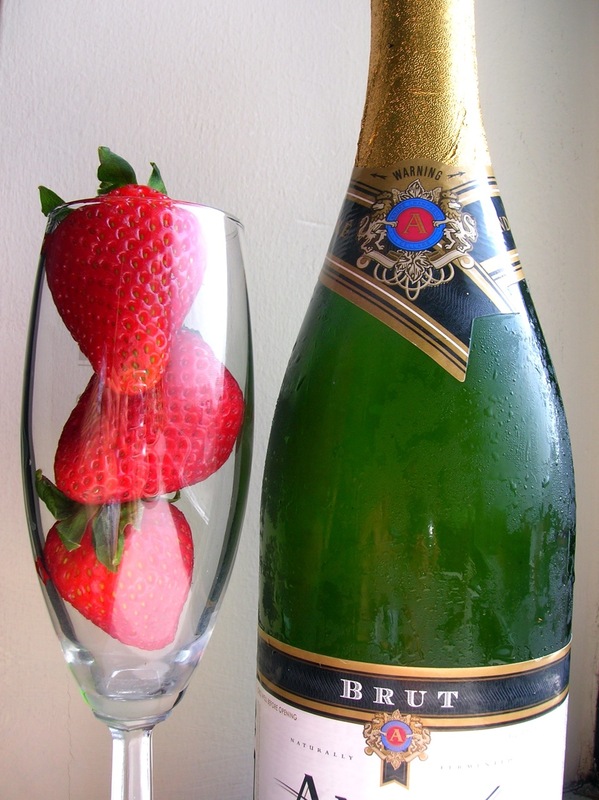 Several hours in advance, chop up the strawberries and soak them in a bowl with 1 cup Champagne. (I only soaked them for an hour and it wasn't long enough. I think you could even soak them in the refrigerator over night if you wanted.) 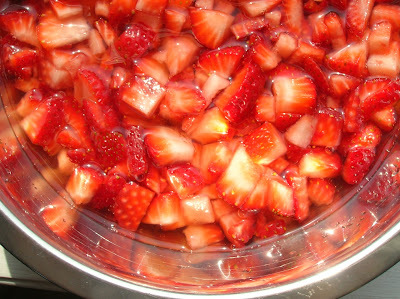 After strawberries are adequately soaked, strain them and set them aside. Heat remaining Champagne, water, sugar, and lemon in a saucepan. Bring to a boil and cook for 10-15 minutes, stirring occasionally. Cool liquid in refrigerator or ice bath. Once liquid is chilled, pour in ice cream maker and churn. Once sorbet has thickened add in strawberries and churn for an additional minute. Absolutely delicious--I thought the champagne tasted great. Word to the wise: if you soak the strawberries too long in the champagne they will lose their color, so maybe you could do half and half (part for a long time, which will color the champagne, and part for a short time, which will keep the strawberries soft yet preserve their color). Did you include the champagne soaking liquid in the "heat remaining champagne" part, or just discard it and use the 2 remaining cups? Use one cup of Champagne to soak the strawberries and then discard it. Heat the remaining two cups with the water, sugar, etc. Hope that helps! drive the message home a little bit, but instead of that, this is great blog. Please let me know if you're looking for a author for your site. You have some really great posts and I think I would be a good asset. If you ever want to take some of the load off, I'd love to write some content for your blog in exchange for a link back to mine. Excellent site. Plenty of helpful info here. I'm sending it to a few pals ans also sharing in delicious. And certainly, thank you in your sweat! peer your post. Thank you so much and I'm taking a look ahead to touch you. Will you kindly drop me a e-mail? it ;) I may revisit yet again since i have book marked it. Anyway I am adding this RSS to my email and can look out for a lot more of your respective exciting content. I visited many web pages but the audio feature for audio songs existing at this web page is truly wonderful. other folks I've read stuff from. Thank you for posting when you've got the opportunity, Guess I will just bookmark this site. If some one desires expert view on the topic of running a blog then i suggest him/her to visit this weblog, Keep up the pleasant work. Asking questions are truly nice thing if you are not understanding anything entirely, however this piece of writing presents pleasant understanding even. Good way of telling, and pleasant post to obtain data concerning my presentation subject matter, which i am going to convey in institution of higher education. What's up to all, the contents present at this website are really amazing for people knowledge, well, keep up the nice work fellows. therefore he/she wishes to be available that in detail, therefore that thing is maintained over here. having a look forward to your subsequent submit, I'll try to get the hang of it! valuable experience on the topic of unexpected emotions. Yes! Finally something about preferable. more attention. I'll probably be returning to see more, thanks for the advice! info in such a perfect method of writing? I've a presentation next week, and I am at the look for such information. I wouldn't mind creating a post or elaborating on many of the subjects you write regarding here. Again, awesome blog! I wish more people would read this and I have found a similar website, check this once ice cream cups wholesale visit the site to know more.